“The thing about kids with Autism is that they are looking for something in their life to focus on. They don’t know why they want to focus on something, but a huge thing with Autism is that we get focused on something that can stay in our life permanently. Finding something we like is makes us feel like we are in a safe haven where we can escape the stress of living in a world where we don’t belong. I have seen this first hand obviously with myself, but also other kids with Autism who I have given cards to. “Like me, most of the kids I shared the cards with were hooked immediately. Autism makes us need to be very organized with a passion for numbers and appealing imagery. We are very attracted to shiny objects so cards like Holo FX in SP Authentic, acetate cards in Upper Deck ICE or base cards like you have in Upper Deck’s Black Diamond are very appealing visually to kids with Autism. 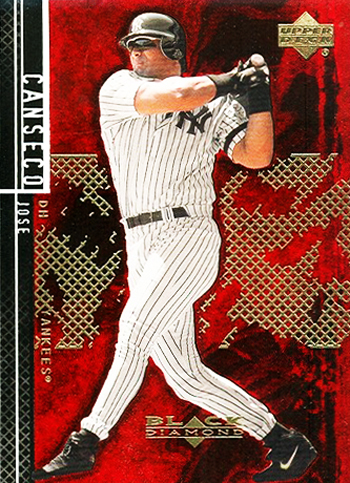 Shiny cards like Upper Deck’s Black Diamond product line tend to be very visually appealing and pleasing to children with Autism. “My son started collecting cards at age five. At first he collected Pokémon and Yu-Gi-Oh! cards, thanks to a family friend giving him a full box. Eventually I got him into baseball cards because they were something I knew about and it was a hobby we could enjoy together. His first reaction to baseball cards was with amazement. He had heard some of the names on television and he hard some of the kids on his baseball team talk about them, but now he was seeing and experiencing them in an entirely new way. “Shawn’s collecting differs from your basic collector. He enjoys the hobby to learn more about the players and the history of the teams. He recently bought a team set of the 1970 Seattle Pilots, a team I had never heard of. He told me about the history of the team and he taught me something I would have never known if it wasn’t for his hobby. He is always on Wikipedia looking up more information on his favorite player’s cards. He has always been fascinated numbers and he excels in math. With sports cards having the players statistics listed on the back, he has a lot of information and numbers to absorb which he loves. “To narrow down his favorite cards is a hard thing to do because he doesn’t really see them that way. But I do know he is very proud to have a few nearly complete Upper Deck sets that he has put together by hand. Just going to the local card shop and buying a few at a time. The last one he has been working on is the 1989 Upper Deck Baseball Set. He can’t wait till he gets the Ken Griffey Jr. card. Shawn spending some time in his “happy place” enjoying his Upper Deck baseball cards. “The knowledge he has gained on the sport of baseball from his collecting has helped him play the sport also. 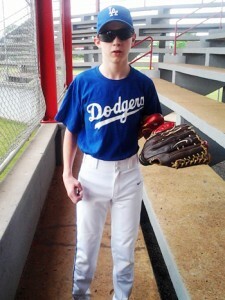 He has played baseball for eight years now and plans to keep playing as long as he can. Baseball is his favorite sport over all with hockey coming in a close second. Shawn loves to play the sport of baseball as well and with some hard work, who knows, maybe Upper Deck will be making trading cards of him some day! I find it really interesting that although both of these parents didn’t know each other or work with each other on this story, yet they both say that cards help their child find their “happy place.” Clearly there is something bigger happening here with trading cards and Autistic youth and we here at Upper Deck think it is awesome. Here we are creating sports cards focusing our efforts on die-hard sports fans, not realizing there is another community out there enjoying and experiencing the products in a totally different way. Special thanks to both dad’s for sharing their family’s stories with us here. If you are a parent with child who has Autism or Asperger’s Syndrome who has seen your child have a good experience with trading cards, please share your story in the comment section below! Shawn is loving all the new upper deck cards that are out there. Thank you for turning him on to all that you have. He told me that he refuses to buy anything but Upper Deck from now on. name indicated with the principal focus on learning rather than amusement. Although, there’s an entertainment facet to keep your sons or daughters engaged, each one game is generally designed to work on a specific expertise or program, such as numbers or scientific discipline. Thanks for your write-up.